One of the biggest questions you may have when buying your first paddleboard is the issue of storage: "where on earth will I put a 10 foot (or longer) board?" Some people opt to buy an inflatable paddleboard for this very reason - because it deflates to store compactly when not in use. But lack of space should not be a deciding factor in whether you choose to get a rigid board, even if you live in a small place. SUP storage racks make use of space you didn't even realize you had. There are so many different kinds of paddle board racks that maximize the use of space, like SUP ceiling racks, freestanding SUP racks, outdoor SUP racks, and more. (1) It is essential to keep your paddleboard out of the sun. 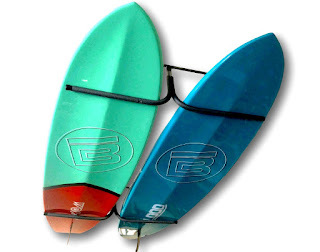 Do not store your board in a place where it will be under direct sunlight, even if it is indoors. That spot in your living room that receives a lot of sun all day long may not be the best home for your board. Although boards look great when the sun is shinning on them, it is not good for them. The sun will age the colors of your board making them fade or become washed out. (2) Always rinse off your board with fresh water after your paddle, and especially at the end of the season. Make sure you have washed off any sand, dirt or grass that may still be on the board after you have used it. This is very important when storing your board for an extended period of time. (3) Take care of any nicks you may have done to your board. Sometimes we do not even notice, until we are out on the water. Rigid boards are delicate. Be careful not to drop or bang your board up against anything while transporting it from the water to the place of storage. If you find you have penetrated the top layer of the board, repair it right away. (4) When transporting your board, always do it with the utmost care. 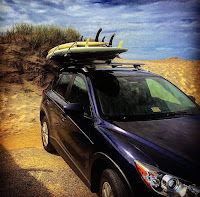 How you choose to strap your board onto a car will largely depend on what kind of vehicle it is and how many boards are being transported. Take a look at different car rack and tie down options and choose what suits you best. Even if you live in a small apartment, as long as you have space on a wall like a hallway long enough to fit a board, you have a place to store it. There are many racks that maximize the use of space in small places. For example, the Naked SUP rack. In the off-season, your board can become a decorative piece in your home! If you have a garage but it seems full, check out paddleboard ceiling racks. 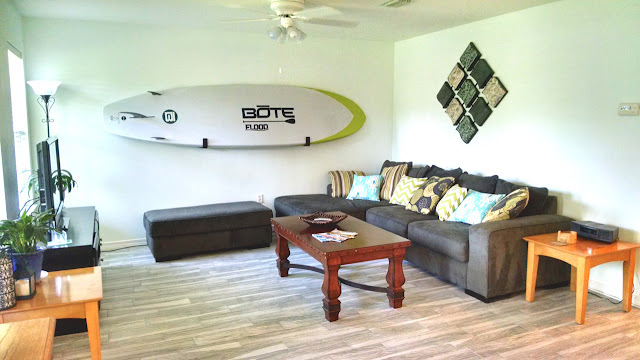 So take a look around your home, garage, or storage locker and you will almost surely find the perfect off-season storage spot for your paddle board.